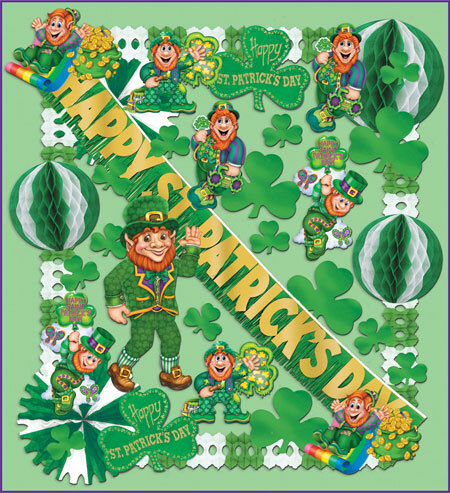 Colorful and festive, our Saint Patrick's Day Party Kits are a must-have for any "St. Patty's Day" Event. 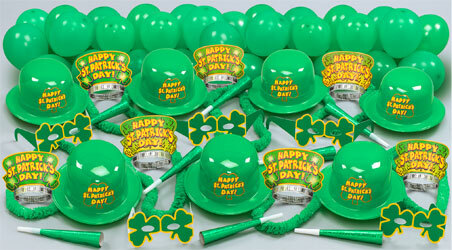 Each St. Patrick's Day Kit includes Irish Derby Hats, Shamrock Glasses, Balloons, and More! 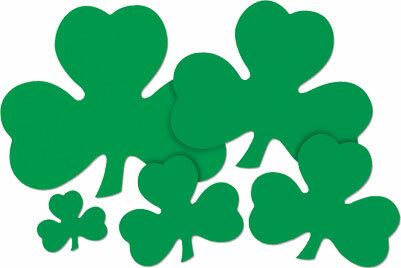 Complete Decorating Kits and Individual Shamrock Cut-Outs are also available. Saint Patrick's Day Mugs – Great for Green Beer or Any Drink You Prefer! Celebrate in style with our one-of-a kind Acrylic Plastic St. Patrick's Day Mugs. 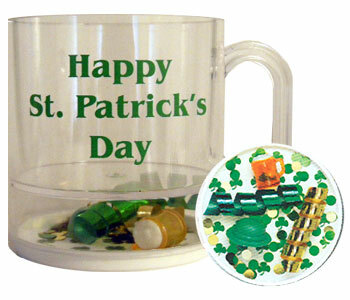 Each 12 Ounce Plastic St. Patrick's Day Mug features a festive base compartment with Irish theme trinkets. The Mugs are available in sets of twelve. These durable Plastic Glasses are custom imprinted with the design and message of your choice. 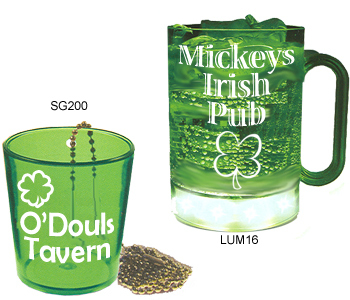 If you’re looking for something unique for your Saint Patrick’s Day event, try our 16 ounce Light Up Custom Mugs and Hanging Shot Glasses! Production and shipping time is 3-4 weeks. SG125 1.25oz Shot Glass .59 .55 .49 .45 .40 .38 1-¼" 1-¼"
SG150 1.5oz Shot Glass .59 .55 .49 .45 .40 .38 1-3/8" 1-3/8"
SG200 2.0oz Shot Glass .64 .59 .55 .52 .48 .45 1-½" 1-½"
LUM16 16oz Light Up Mug 3.64 3.34 3.24 3.05 3.00 2.95 3" 3"